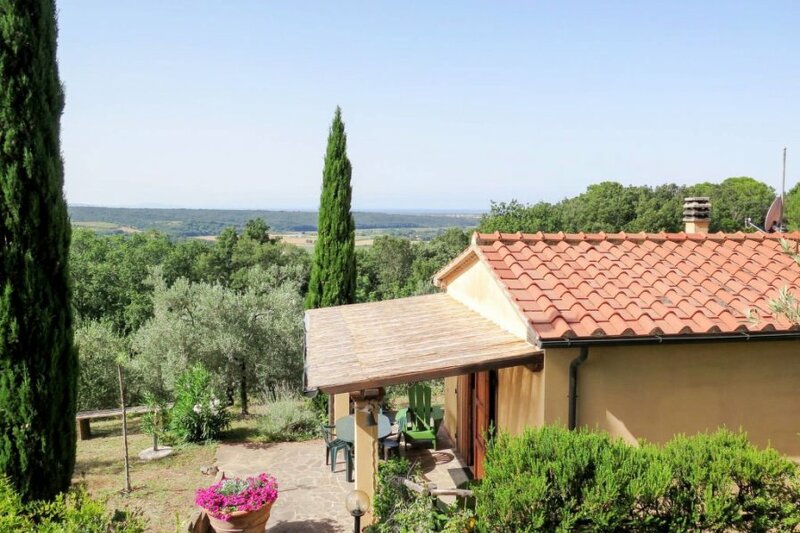 This 1 bedroom villa is located in Riparbella and sleeps 4 people. It has WiFi and barbeque facilities. The villa is near a beach. Detached house, 2 - 4 people, 1 room/s, 1 bathroom/s, approximately 47 m², 1 floor/s. Equipment: satellite TV; internet access Wi-Fi (payment). Electricity according to consumption approximately € 0.30/​kWh. Fire wood according to consumption approximately € 15/​100 kg. Holiday resort tax. Linen/towels available. Change of bed linen/​towels every 7 days included. Deposit € 150 (in cash). Cot only within the maximum occupancy, free of charge (on order). Pet 1 pet allowed (please advise prior to arrival; additional animals on request only). Internet € 10 per week. Situation: detached position, hillside location Riparbella, sea view, panoramic view. Access/parking: cart track, approximately 1.7 km, steep. 1 x parking near the house approximately 50 m.
Access to the house via footpath. Estate (private use): approximately 9 ha, open plot. Outdoor facilities(private use): terrace 10 m² (roofed), furnishing provided, deck chairs, sunshade, brick barbecue. The villa is described as good value for money. This villa is located in Riparbella. The nearest airport is 53km away. It is set in a convenient location, just 0 metres away from a beach and 6km away from the city center. The villa has free wireless internet. It also has a BBQ.